Katrine Browne découvre que ses ancêtres de New England étaient les plus grands vendeurs d’esclaves de l’histoire des USA. Elle en fait un film. Réalisatrice / Productrice : Katrina Browne. Co-Réalisatrices : Alla Kovgan, Jude Ray. Co-Productrices : Elizabeth Delude-Dix, Juanita Capri Brown. en association avec WGBH, Boston. First-time filmmaker Katrine Browne discovers her New England ancestors were the largest slave traders in US history. Traces of the trade follows Browne and nine fellow de Wolf descendants as they set off to retrace the Triangle Trade : from their old Hometown in Rhode Island to slave forts Ghana and sugar plantation ruins in Cuba. Step by step uncover the extet of the North’s complicity in slavery while also stumbling through the minefield of contemporary race relations. Co-Directors: Alla Kovgan, Jude Ray. Co-Producers: Elizabeth Delude-Dix, Juanita Capri Brown. From 1769 to 1820, DeWolf fathers, sons and grandsons trafficked in human beings. They sailed their ships from Bristol, Rhode Island to West Africa with rum to trade for African men, women and children. Captives were taken to plantations that the DeWolfs owned in Cuba or were sold at auction in such ports as Havana and Charleston. Sugar and molasses were then brought from Cuba to the family-owned rum distilleries in Bristol. Over the generations, the family transported more than ten thousand enslaved Africans across the Middle Passage. They amassed an enormous fortune. By the end of his life, James DeWolf had been a U.S. Senator and was reportedly the second richest man in the United States. The enslavement of Africans was business for more than just the DeWolf family. It was a cornerstone of Northern commercial life. The Triangle Trade drove the economy of many port cities (Rhode Island had the largest share in the trade of any state), and slavery itself existed in the North for over 200 years. Northern textile mills used slave-picked cotton from the South to fuel the Industrial Revolution, while banks and insurance companies played a key role throughout the period. While the DeWolfs were one of only a few « slaving » dynasties, the network of commercial activities that they were tied to involved an enormous portion of the Northern population. Many citizens, for example, would buy shares in slave ships in order to make a profit. 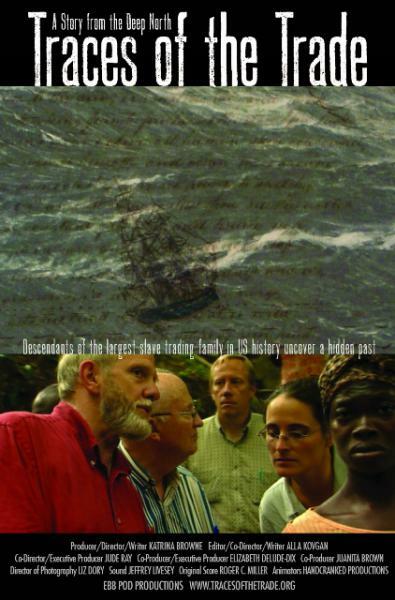 The film follows ten DeWolf descendants (ages 32-71, ranging from sisters to seventh cousins) as they retrace the steps of the Triangle Trade, visiting the DeWolf hometown of Bristol, Rhode Island, slave forts on the coast of Ghana, and the ruins of a family plantation in Cuba. Back home, the family confronts the thorny topic of what to do now. In the context of growing calls for reparations for slavery, family members struggle with the question of how to think about and contribute to « repair. » Meanwhile, Browne and her family come closer to the core: their love/hate relationship with their own Yankee culture and privileges; the healing and transformation needed not only « out there, » but inside themselves. The issues the DeWolf descendants are confronted with dramatize questions that apply to the nation as a whole: What, concretely, is the legacy of slavery-for diverse whites, for diverse blacks, for diverse others? Who owes who what for the sins of the fathers of this country? What history do we inherit as individuals and as citizens? How does Northern complicity change the equation? What would repair-spiritual and material-really look like and what would it take? Katrina produced and directed Traces of the Trade, and founded the Tracing Center on Histories and Legacies of Slavery. She has an M.A. in Theology from the Pacific School of Religion where she wrote a thesis on film and democratic dialogue. She now lives in Washington, D.C.
Keila and her sister Holly Fulton both grew up in Bristol, Rhode Island. Tom is the author of Inheriting the Trade: A Northern Family Confronts Its Legacy as the Largest Slave-Trading Dynasty in U.S. History (Beacon Press, 2008), about his experiences during the family’s journey. For further information, visit his website. Holly has been a French & ESL teacher and a diversity trainer in France and various states. She lives in Concord, Calif., with her husband, Bill, and gives talks and facilitates discussions as outreach for Traces of the Trade. Elly grew up in Reno, Nevada. Ledlie has been an Episcopal priest for 50 years, with parishes in Jersey City, Newark, Greenwich Village and Florence, Italy. Dain participated in the documentary along with his brother, Jim, and nephew, James (below). James is the executive director of the Tracing Center on Histories and Legacies of Slavery, the organization founded to carry out the work inspired by Traces of the Trade. In addition to appearing in the film, James served as the film’s principal historical consultant, for which he was nominated for an Emmy® Award. Jim was born in Providence, Rhode Island and is now retired with his wife, Shirley. Elizabeth creates art to raise awareness about the present-day impacts of the legacy of slavery and white privilege. As co-producer, Juanita co-designed the Traces journey and facilitated many of the family’s dialogues. She received policy-related degrees from Stanford University and the University of California at Berkeley, and studied in Ghana. Harold facilitates a monthly city-wide racial dialogue in Denver that has lasted for ten years. He participated in the documentary because of his connections with two family members, Holly and Keila. He has over 30 years of systems development experience with IBM and the airline industry. There are several spouses who are doing public work with the film. Shirley is a registered nurse, poet and workshop facilitator. She and her husband, Jim Perry, promote the documentary to encourage dialog about race. Bill is retired from a career as a psychotherapist and a pastor. He lives in Concord, CA with his wife, Holly Fulton. He and Holly are available to facilitate discussions of the film in the San Francisco Bay Area and beyond. Constance is a self-employed national consultant. Constance is a descendant of slaves in North Carolina. and throughout Rhode Island that supported us. The extended family of DeWolf descendants and spouses. Our many productions assistants and interns. Produced in association with WGBH, Boston. This program was produced by Ebb Pod Productions LLC which is solely responsible for its content. Katrina Browne ontdekte dat haar voorvaderen uit de familie DeWolf het grootste aandeel hadden in de Amerikaanse slavenhandel. Samen met negen familieleden volgde zij in 2008 – het jaar van de herdenking dat twee eeuwen eerder de slavenhandel werd afgeschaft – het spoor van de’Triangle Trade’: een reis vanaf hun bakermat in Bristol, Rhode Island, New England naar de forten in Ghana, waar de slaven ingescheept werden, en de suikerplantages in Cuba, die nu verlaten en geruïneerd zijn. Stap voor stap ontrafelen ze de historische gebeurtenissen, maar ook is er ruim aandacht voor de hedendaagse gevoeligheden bij interraciale relaties.